Since the late 1950s and '60s, scientists have believed that the Earth's magnetic field has captured a lot of the solar wind - charged particles flowing out from the sun - and formed an immense, comet-like cloud of electrified gas that surrounds our planet. 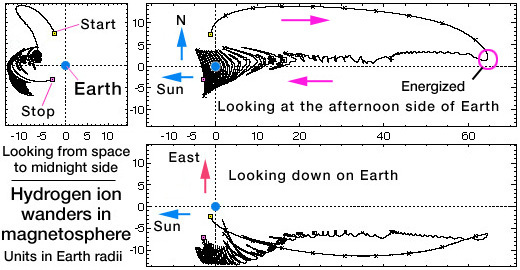 An accidental discovery in the 1980s and new data collected since 1996 indicate that this magnetosphere may well be filled by a fountain of energized gas (right) blowing from the north and south poles. You don't need to stock up on bottled air - the leakage is tiny compared to Earth's atmosphere - but the studies are making us take a new look at 40-year-old assumptions about how the Earth interacts with the space environment. The new look will be discussed in two papers by Drs. Rick Chappell and Barbara Giles at the fall meeting of the American Geophysical Union in San Francisco. Chappell and Giles are plasma physicists at NASA's Marshall Space Flight Center. Starting with the discovery of the Van Allen radiation belts by the first U.S. satellite in 1958, scientists have known that the Earth is surrounded by a cloud of electrified gas. This cloud, called the magnetosphere, is constrained by Earth's magnetic field, compressed by the solar wind to within about 100,000 km of the Earth on the sunward side, and drawn out by the solar wind to more than a million km on the night side. "The conventional wisdom from the time I was in school 30 years ago," said Chappell, NASA/Marshall's associate director for science, "was that because these ions have so much energy (about 1,000 electron-volts [1 keV], they must come from the sun." "Why should it be from the ionosphere?" Giles asked, repeating the thinking of the 1960s and '70s. The ionosphere, the top layer of Earth's atmosphere from about 60 km and up, is composed of ionized atoms and molecules. "It's so cold. What they were measuring they assumed came from the solar wind because the energies were right." The magnetosphere (left) is a complex structure that changes with the solar wind. Major features include the polar cusp where the magnetic field lines are almost vertical and leave the Earth's poles exposed to space, and a neutral plasma sheet which extends outward from around the magnetic equator. This complex region is being explored by the International Solar-Terrestrial Physics (ISTP) campaign comprising satellites such as Polar (right) which carries the TIDE instrument. The perception started to change in the mid-1980s following the Aug. 3, 1981, launch of two Dynamics Explorer satellites designed to study the magnetosphere near the Earth. DE-1 carried Chappell's Retarding Ion Mass Spectrometer (RIMS), designed to measure the population of the plasmasphere, a torus or donut of low-energy in the inner magnetosphere. To Chappell's surprise, the real find was around the north pole where RIMS measured gases flowing upward from the ionosphere into space as DE-1 arced to about 4.6 Earth radii above the pole (the orbit was 464 x 23,370 km [288 x 14,490 mi]). "The more we measured it," he said, "the more we realized that this was a big source of material." RIMS measured ions of hydrogen, helium, oxygen, and nitrogen rising at different speeds and on different trajectories. Apparently, the particles that slammed into the ionosphere to paint the aurora borealis also energized enough atoms to head spaceward. (The same is true of the south pole where DE-1 made similar observations.) The acceleration mechanism is not fully understood, though. Giles said that very low frequency (VLF) radio waves, emitted in the magnetosphere, may contribute energy. In 1987, Chappell and the RIMS team published a paper describing the polar ion fountain and described the ionosphere as a "fully adequate source of material for the magnetosphere." That means that scientists did not need to look to the solar wind to fill the magnetosphere. Earth, they contended, does a good job of supplying all the materials. RIMS, though, was not fully adequate to resolve the challenge that the science team had laid down. Its orbit only went to about 4 Earth radii (about 25,6000 km [ 16,000 mi]), and it was limited in measuring the environment around it. RIMS also could not measure the lowest energy ions which would help confirm that the source was the ionosphere and not the solar wind. It turns out that all spacecraft develop an electrical charge. For high altitude satellites, exposure to sunlight and the passage through plasmas give a satellite a charge of about 5 to 10 eV. A small cloud of ions, a plasma sheath, builds around the spacecraft and repels anything with lower energy. "We needed a device to neutralize that plasma sheath," Chappell said. "Unless you can do that, you won't ever see those particles." As luck would have it, NASA/Marshall had proposed building a Thermal Ion Dynamics Experiment (TIDE) for the upcoming Polar spacecraft which would be part of the International Solar Terrestrial Physics campaign. "Because of the new technologies, we're just at the point where we can make these measurements," Giles said. "Controlling spacecraft potential is something that's fairly new." TIDE works with a Plasma Source Instrument (PSI), a small ion gun that would squirt enough electrified xenon out to neutralize the spacecraft's plasma sheath. An earlier SSL story explained why Plasmas Can't Hide from Neutralized TIDE. "That allows the naturally low-energy ions to get to the spacecraft," Chappell said. While TIDE operates continuously, the plasma source has only been used for two months since Polar was launched because the plasma cloud obscures readings for other instruments. "And lo and behold, there's all this low-energy plasma flowing out of the atmosphere and into the magnetosphere," Chappell said. Some of the material does fall back to Earth, mostly the heavier ions with low energies, but enough apparently is accelerated to reach into the tail of the magnetosphere. TIDE expanded on RIMS's measurements and showed that the ion flow starts with very low energies, down to a few tenths of an electron-volt, and that its altitude is twice as high as DE-1's orbit. "The really incredible thing," Chappell said, "is that if you do a very careful model of the magnetic field and electric field, and then put in 10 eV particles, they go into the plasma sheet, and are energized at least a thousandfold." A computer model depicts the path of a hydrogen ion - a free proton - as it arcs away from the northern ionosphere to about as far away as the moon's orbit (384,000 km [240,000 mi]). When it flows into the plasma sheet, it is dramatically energized - from about 5 eV to 5,000 eV. Then it zooms back along the sheet and bounces back and forth (an effect called mirroring) along Earth's magnetic field lines. The simulation only shows about 3-1/2 hours of one of a large number of possible paths. In the top left view (from deep space towards the Earth), the ion would rise out of the screen, dive back, and then zig-zag into the screen as if tracing a series of ribs. As instrument designs were advancing, so were computers and software which could model what is happening inside the magnetosphere. Dominique Delcourt, then working at NASA/Marshall, developed a program which takes the data from TIDE and shows particles zooming up to 60 Earth radii (almost 400,000 km) into the magnetotail, zipping back along the plasma sheet, and then bouncing back and forth along the Earth's magnetic field lines. The last effect is called mirroring. As a particle moves along a magnetic field line, its orientation to the field line changes until the particle is repelled towards the other pole. How deep the particle penetrates depends on its angle with respect to the magnetic field. If the angle is aligned with the magnetic field, the particle will hit the upper atmosphere and cause the aurora borealis or australis. If it is at right angles, the particle will mirror and head in the other direction. "We're not starting with a solar wind particle at 1 keV," Chappell sad, "but with atmospheric particles at a few eV. They make up everything you see up there." Even if it is not filling the magnetotail, or even contributing a lot of material, the solar wind still plays an important role, Chappell said. It generates the electric field which energizes the tail, and even compresses it so it squirts materials back towards Earth to cause substorms that disrupt satellite communications, interfere with terrestrial power lines, and push the auroras towards lower latitudes. Other satellites at present do not carry instruments that can neutralize the plasma sheath as TIDE does. Flights with suborbital rockets can only make limited contributions to solving the question. Giles said: "Rocket flights work on a microscale. TIDE works on a global scale and long-term trends." Rockets also sample the source region for the polar fountain, while TIDE looks at the destinations and what happens to the particles. Because each orbit measures a single arc over the polar region, Chappell would like to make a series of low-energy measurements, with the plasma source on, to get full coverage of the entire polar region under a range of seasonal conditions and different levels of solar activities.